Flagstaff, Arizona: Northland Press, 1987. 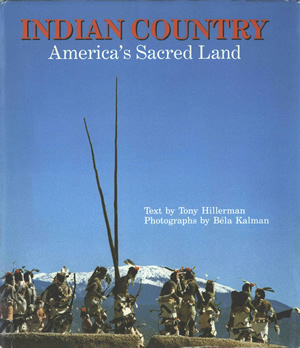 Indian Country: America's Sacred Land, with text by Tony Hillerman and photographs by Béla Kalman, was published in 1987 by Northland Press in Flagstaff, Arizona, as an oversized "coffee table" hardcover book with a dust jacket. The front and back covers feature Kalman photos. Binding: Fully bound in blue cloth-covered boards. The book title, authors' and publisher's name are embossed in gold on the spine.